The skin not only protects the body from pathogens and external injury, it is a highly dynamic organ that plays a key role in maintaining body homeostasis. The skin is a barrier to microorganisms, water, and excessive sunlight (UV light). Oily secretions onto the surface of the skin form an acidic protective film (pH 4.0-6.8) that waterproofs the body and retards the growth of most pathogens. The protein keratin in the epidermis also waterproofs the skin, and the cornified outer layer (stratum corneum) resists scraping and keeps out microorganisms. As mentioned previously, exposure to UV light stimulates the melanocytes in the stratum basale to synthesize melanin, which absorbs and disperses sunlight. In addition, surface friction causes the epidermis to thicken by increasing the rate of mitosis in the cells of the stratum basale and stratum spinosum, resulting in the formation of a protective callus. The thickened, keratinized, and cornified epidermis of the skin is adapted for continuous exposure to the air. In addition, the outer layers are dead and scalelike, and a protein-polysaccharide basement membrane adheres the stratum basale to the dermis. Human skin is virtually waterproof, protecting the body from desiccation (dehydration) on dry land, and even from water absorption when immersed in water. 3. Through retention of heat from constricted blood vessels (fig. 2.10). 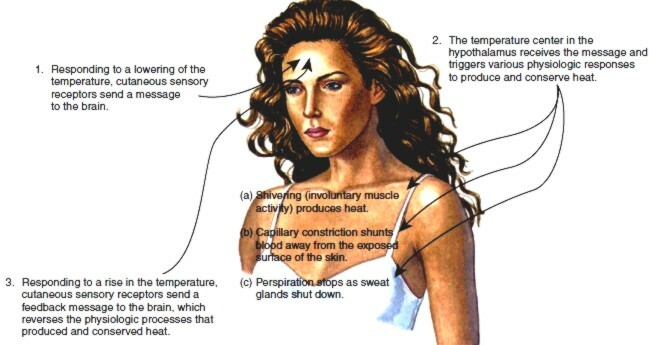 FIGURE 2.9 Temperature regulation involves cutaneous sensory receptors that relay messages of decreased body temperature to the brain. This triggers a response that can quickly generate up to 5 times the normal rate of body heat production. 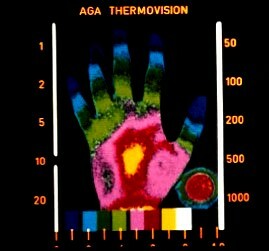 FIGURE 2.10 A thermogram of the hand showing differential heat radiation. Hair and body fat are good insulators. Red and yellow indicate the warmest parts of the body. Blue, green, and white indicate the coolest. The volume of perspiration produced is largely a function of how much the body is overheated. This volume increases approximately 100 to 150 ml/day for each 1° C elevation in body temperature. For each hour of hard physical work out-of-doors in the summertime, a person may produce 1 to 10 L of perspiration. Excessive heat loss triggers a shivering response in muscles, which increases cellular metabolism. Not only do skeletal muscles contract, but tiny smooth muscles called arrectores pilorum, which are attached to hair follicles, are also contracted involuntarily and cause goose bumps. Because of the effective protective barriers of the integument already described, cutaneous absorption (absorption through the skin) is limited. Some gases, such as oxygen and carbon dioxide, may pass through the skin and enter the blood. Small amounts of UV light, necessary for synthesis of vitamin D, are absorbed readily. Of clinical consideration is the fact that certain chemicals such as lipid-soluble toxins and pesticides can easily enter the body through the skin. The integumentary system synthesizes melanin and keratin, which remain in the skin synthesis of vitamin D, which is used elsewhere in the body and begins in the skin with activation of a precursor molecule by UV light.The molecule is modified in the liver and kidneys to produce calcitriol, the most active form of vitamin D.Only small amounts of UV light are necessary for vitamin D synthesis, but these amounts are very important to a growing child.Active vitamin D enters the blood and helps regulate the metabolism of calcium and phosphorus, which are important in the development of strong and healthy bones. Rickets is a disease caused by vitamin D deficiency (fig.2.11). 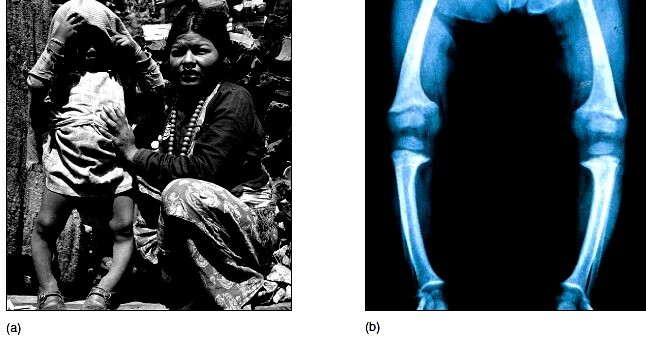 FIGURE 2.11 (a) Rickets in a child from a Nepalese village, whose inhabitants live in windowless huts. During the rainy season, which may last 5 to 6 months, the children are kept indoors. (b) A radiograph of a 10 month-old child with rickets. Rickets develops from an improper diet and also from lack of the sunlight needed to synthesize vitamin D.
Highly specialized sensory receptors that respond to the precise stimuli of heat, cold, pressure, touch, vibration and pain are located throughout the dermis. Called cutaneous receptors, these sensory nerve cells are especially abundant in the skin of the face and palms, the fingers, the soles of the feet, and the genitalia. They are less abundant along the back and on the back of the neck and are sparse in the skin over joints, especially the elbow. Generally speaking, the thinner the skin, the greater the sensitivity. Humans are highly social animals, and the integument plays an important role in communication. Various emotions, such as anger or embarrassment, may be reflected in changes of skin color. The contraction of specific facial muscles produces facial expressions that convey an array of emotions, including love, surprise, happiness, sadness, and despair. Secretions from certain integumentary glands have odors that frequently elicit subconscious responses from others who detect them.